"Heroes will die," Darkest Dungeon tells you early on, "And when they die they stay dead." Thus begins your descent into a game that could not be more aptly named. Let's just come out and say it - it's not much of a spoiler to tell you that the rumours are true. Darkest Dungeon is a brutal, twisted, rogue-like RPG that has you journey into the dark. You're unlikely to come out unchanged. Around the hill a hamlet of would-be treasure hunters and a veritable service sector to look after them has appeared. Think of it as an Everest basecamp for the unhinged from which you'll draw a team of 'heroes' to explore the dungeons beneath the mansion. This is where things start to get difficult. There's no 'best four' waiting for you here, and any character that dies down there stays dead. Not only will you have to manage their different abilities and skills, you'll also have to look out for their mental health, because you don't venture through chasms of unending horror without it impacting your wellbeing. Once you enter the 2D dungeon things get toe-curlingly difficult. You have to deal with ever-growing levels of complexity as you battle all sorts of monsters down there in the dark, and you'll get lots of things wrong in lots of different ways that feel cruel but never unfair. It's all presented in an art style that's grimly amusing - imagine someone had made a darkly humorous comic of Edgar Allen Poe's The Fall of the House of Usher and you're about there. 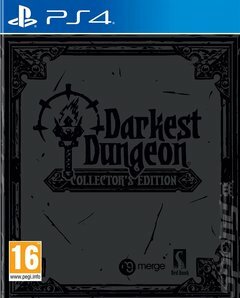 Darkest Dungeon: Collector's Edition includes the original game and all the DLC: The Shield Breaker; The Color of Madness; The Crimson Court and The Musketeer. Heroes will die. Spirits will be crushed. Will you survive?